Is it over for Wade Barrett? After a prolonged absence from the ring due to persisting injuries, it appears “Cosmic King / Bad News” Wade Barrett will not be re-signing with WWE when his contract expires in a few months. WWE Diva division in best shape ever! After #GiveDivasAChance, which trended in February of 2015, high-lighted how the WWE Universe’s overwhelmingly negative attitude toward the women’s division, the Big Fed has turned an important corner. Heading into the 2016 Fastlane pay-per-view, WWE’s female roster is the largest and most talented in nearly a decade. Increased air time devoted to the Divas, as well as multiple story-lines and programs within the division are promising signs for the future of women’s wrestling on the big stage. As this week in wrestling draws to a close, WWE TLC: Tables, Ladders & Chairs and NXT Takeover: London are both in the bag. Put side by side, one can see exactly how the shows differ. Putting aside variables such as attendance, production value and star power, a large difference between shows was in the construction of storylines. Samoa Joe heads to London to challenge fellow veteran Finn Balor for the NXT Championship. The story of the match has become whether or not the champ can survive, counter or escape Joe’s dreaded signature submission, the coquina clutch. The angle is an old promoter’s trick, and has stood the test of time. Building up a signature move and its effectiveness is a hallmark of professional wrestling, and its nice to see it still applied today. The latest episode of NXT, live from Orlando, saw a new demeanor displayed by Full Sail veteran tag team Enzo Amore and Colin Cassady. The two Jersey boys, along with their Staten Island princess Carmella, bi-passed their trademark microphone introduction. Instead, they wore stone scowls as they marched unceremoniously to the ring. The normally boisterous duo proceeded to attack their opponents with pure power offense, making short work of Corey Hollis and John Skyler. Last week, Michael Cole announced that he would take over responsibilities as General Manager of NXT while William Regal recovers from neck surgery. The declaration that Cole was “in charge” received a round of resounding boos from the Full Sail University audience. The reception was not helped by Cole’s first official announcement as GM: that after receiving word from “corporate”, the championship match between Eva Marie and Bayley would happen regardless of Regal’s previous wishes. Women’s wrestling once again reigned supreme at Full Sail University, with three single’s matches featured on Wednesday’s NXT television program. Fan-favourite veteran Carmella challenged the juggernaut Nia Jax. Emma continued putting over her new conceded, heelish ways in a match against development talent. To close the show, Bayley defended her NXT Women’s Championship against number one contender, Alexa Bliss, but was then met with a new challenge. Dash and Dawson new champions! Scott Dawson and Dash Wilder defeated The Vaudevillains this past Wednesday to become new NXT Tag Team Champions. The match was described by ringside announcers as “a dissection”, and it is difficult to disagree. Dawson and Wilder displayed the same grit, aggression and technical ruthlessness they have made their trademark as of late. Crews screwed as Joe turns heel! 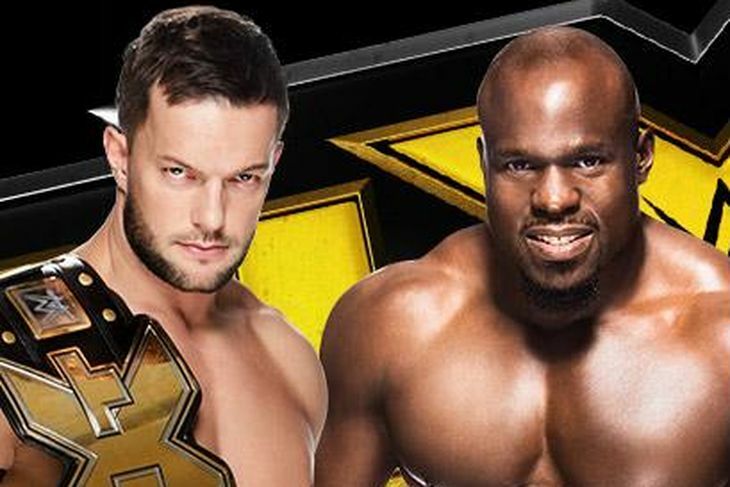 NXT brought a big fight feel to Wednesday night as number one contender Apollo Crews challenged Finn Balor for the NXT Championship. After a solid match, the competitors were taking things home when out of nowhere came Baron Corbin, who took out Crews before turning his fury on the champ.